Bruce Lombard is a Professional MMA & Muay Thai Coach. 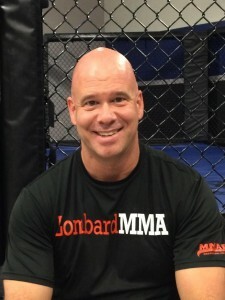 Coach Lombard has been training in numerous martial arts systems since the 1980′s, he has been coaching and teaching MMA and Muay Thai for two decades. Coach Lombard has trained in multiple disciplines that include: Muay Thai, Boxing, Catch Wrestling, Shooto, Jiu-Jitsu, Wrestling, Jeet Kune Do, and Wing Chun. Bruce has trained under world acclaimed fighters and coaches such as: Greg Nelson, Sean Sherk, Rico Chipparelli, Dan Inosanto, Ajarn Chai Sirisute, Francis Fong, and Bill Gebhardt. Coach Lombard is the creator of MMAFx (Mixed Martial Arts/Football Cross Training) system. Bruce utilizes his experience and knowledge in Mixed Martial Arts to provide a new and dynamic cross training system for collegiate and professional football athletes. Bruce is also the creator of Martial Arts Fitness(MAF). MAF is a Physical Education curriculum designed to bring an alternative fitness activity through martial arts to Physical Education departments and their participating students. Bruce is the developer of LombardMMA-FIT as well. LombardMMA-FIT is a high intensity kickboxing fitness program that incorporates kickboxing and self-defense techniques with calisthenics, plyometrics, and core exercises. It is designed to be a home fitness workout or a classroom fitness program. Bruce earned his undergraduate degree from Penn State University in 1998, and his Master’s of Education in School Counseling from Indiana University of PA, in 2012. Private Martial Arts Training offers the highest level of instruction, knowledge, and experience to best guide members toward their personal martial arts goals technically, physically, and mentally. MMAFx is a mixed martial arts/football cross training program that works with high level collegiate and professional football athletes to help develop and increase their level of: hand speed, arm trapping ability, agility, flexibility, cardiovascular endurance, muscle endurance, balance, body leverage control, and punching power. Martial Arts Fitness. MAF is a Physical Education curriculum designed to bring the history, knowledge, and fitness of martial arts to Physical Education programs and their participating students. LombardMMA-FIT includes authentic kickboxing home fitness workouts and an authentic Kickboxing Boot Camp. Why do generically titled kickboxing home and boot camp fitness workouts when you can actually learn the art and sport of kickboxing with LombardMMA-FIT workouts. "Bruce Lombard Prepares Penn Staters For The NFL Through MMA"
"Five Fighters To Represent LombardMMA At National Muay Thai Event"
How do I get started with Private Lessons? A private lesson FREE consultation can be set up by email, phone, or walk-in sign up. Please refer to the contact page for all the information necessary for contacting Coach Lombard. What does becoming a LombardMMA Premium Member mean? LombardMMA Premium Member receive's access to hundreds of instructional videos to help benefit your own personal development and learning curve. You can also participate in member forum discussions to discuss your training goals and questions with Coach Lombard or other members. What do I need to bring for training during my FREE Week? What unlimited facilities are offered at LombardMMA & LionHeart Fitness? I Don’t have any previous experience in martial arts or boxing, is this ok? Can I develop and improve my levels in Self-Fitness and Fitness?